One of my insights into Pakistan’s socioeconomic evolution was due inadvertently to my father when, as a student of economics, I encountered his changed post-retirement pattern of time use. It was the nature of the change that was surprising. I saw him rise early to monitor the water level in the rooftop storage tank, climb down to check the underground one, turn on the electric motor, then switch it off after an appropriate interval. Often the motor would malfunction and he would arrange to have it fixed. Less frequently, someone would be called to clean the tanks. Over time the pipes to and from the tanks acquired a byzantine complexity with various valves catering to the vagaries of the public supply. A hand pump sprouted in the backyard as a last resort and its water sent for regular testing. Water consumed a big part of our daily conversation. As a social scientist I was intrigued: What was going on? Privatization was a fad at the time and I could sense that the management of household water had become a private responsibility. But this was not really privatization – as I reflected I realized this was the beginning of the atomization of Pakistan’s urban life. Privatization and atomization differ in the scale of their operations. A private provider can cater to an entire city; atomization occurs when each household turns into its own supplier. Conceptually, and in terms of efficiency, this is a huge difference. As an economist, I wondered what the real cost of atomized water provisioning was over and above the tariff that was charged for the intermittent and unreliable public supply. I published my conclusions in a 1994 paper titled The Economics of Household Response to Inadequate Water Supplies. Not surprisingly, I found that the aggregate costs of atomized water provision exceeded those of a modern water supply system even when I ignored many expenses – for boiling impure water, imputed value of household labor, redundancy costs of induced perversities like installation of suction pumps, costs to the environment, etc. Over time I have observed the phenomenon of atomization becoming the defining feature of urban life in Pakistan. First it was security with people taking on the responsibility of protecting their assets and their persons. Then it was electricity with the investments in individual power supplies. As with water, any objective analysis of service provisioning would show that the real costs per unit of atomized provisioning exceed the tariffs at which modern collective supplies can be viably operated by public or private suppliers. People are actually paying more than the higher tariffs they protest. It is not that people are irrational. In subsequent work I found that households rejected higher tariffs for promised better supplies because they did not believe in the promises – they had lost faith in the possibility of efficient service delivery. The atomization of society is thus the flip side of the failure of the state in Pakistan where the public sector is grossly inefficient as a service provider and hopelessly ineffective as a regulator of private suppliers. Part of the problem is well known – the use of the public sector for patronage and the unaccountability of regulatory staff. Equally important, the system design is inappropriate in our context. The role of a monopoly provider is unavoidable for networked services (like water and electricity) where competition is difficult to introduce. But a monopoly provider is not well suited to deliver services at the retail level where variations in demand and income streams are much larger than in developed countries and the rule of law is weak. Intelligent solutions are possible as I saw subsequently in East Asia. Monopoly providers supply bulk metered quantities to neighborhood blocks with private concessionaires responsible for subsequent retail operations. The performance of various concessionaires is subject to public disclosure to monitor egregious variations in cost or quality of service. Neighborhood committees ensure collective pressure for quick dispute resolution. This design is not alien to Pakistan where the Orangi Project in Karachi has shown for sewerage that the mix of public bulk infrastructure and private tertiary operations offers a viable model. Work in rural areas has helped me understand better the natural evolution of service provisioning. Take water: when all households are poor the need is served by the common village well; when a few become better-off, the sensible solution is for them to install private boreholes. However, there is a tipping point – when most households can afford private boreholes, upgrading at the individual level is no longer economically optimal. A central piped supply becomes more cost effective with the few households unable to afford the service subsidized from overall savings. We are witnessing a perverse ruralization of urban life with affluent households resorting to self-provisioning. It is ironic because most rural localities, in the Punjab at least, have passed the tipping point and are ready for central provision, something I documented in a 1993 paper Rethinking Rural Water Supply Policy in the Punjab, Pakistan. Transforming cities into giant villages is madness. A way back to sanity in the provisioning of urban public services is possible. What are needed are appropriate system design and the selection of competent managers. But neither is possible without strong and informed demand from citizens. Learning from experience I tell students that the knowledge we generate as researchers should be directed not to policymakers but to citizens to create an informed lobby for better services. All we need now is to invent a language in which we can communicate with the men and women in the street. Test yourself: Translate Millennium Development Goals into a local language and see how far you can carry the conversation. Anjum Altaf is Dean of the School of Humanities, Social Sciences and Law at the Lahore University of Management Sciences. This op-ed appeared in Dawn on June 11, 2013 and is reproduced here with permission of the author. Millennium Development Follies is a companion post that illustrates how we fail to communicate with our own citizens. The presence of international borders that are closed is unfortunate in many ways. However, to a social scientist they present the possibility of fascinating natural experiments in which locations close to each other but separated by the border can be studied to advantage. For example, the Punjab border separates Kasur in Pakistan from Ferozepur in India by a distance of 39 miles. One would not expect much to change over such a short distance except for policies that are decided at the national or regional levels, e.g., those related to land, taxation, subsidies, etc. If we study the two cities in depth perhaps we might be able to infer the impact of such policy differences on the prospects of the cities and the lives of their residents. The exciting aspect of this proposal is that the academic motivation is only an incidental part of the exercise. We wish to build knowledge slowly from the bottom up leaving behind a lot of interest, awareness, and capacity for sustainability. What we are hoping to do is to link college students and instructors who would carry out the studies in these sister cities over an extended period of time. The students and instructors from paired institutions would use the Internet to participate in each other’s work. In this way we will diversify the development of people-to-people understanding away from metropolitan centers and elite institutions, something which is essential if the movement has to build an appeal with broad support. At the same time young citizens would go beyond the stage of expressing good intentions and be involved in collaborative work accumulating useful information for research and teaching purposes. In the process they would get to know each other in more intimate ways. The study of matched pairs of cities would yield comparisons across international boundaries and across regions within some countries as well. We will draw up simple baseline profiles of these towns using a few key indicators to be spelled out later. The preparation and regular updating of these profiles would be assigned to local academic institutions that would integrate them as class assignments for students of these institutions. The capacity of a core group of teachers would be enhanced to manage these profile updates over a five-year period. At the end of the period we would know better what is going on in small towns and why. We would understand what are the commonalities and differences and what might account for them. In the process we would have built up a lot of local capacity and involved local students in research on local issues. Based on these profiles we would put together an informed research agenda for the future. What we are looking for now are suggestions from readers on how to finalize such a study and to put it into practice. It can be started with just one matched pair so we are looking for individuals who would volunteer to take charge in individual cities. As soon as we have a matched pair, we will specify the details of the next steps. Note: The original idea for such a study was proposed in this post: What’s Happening in Small Towns? 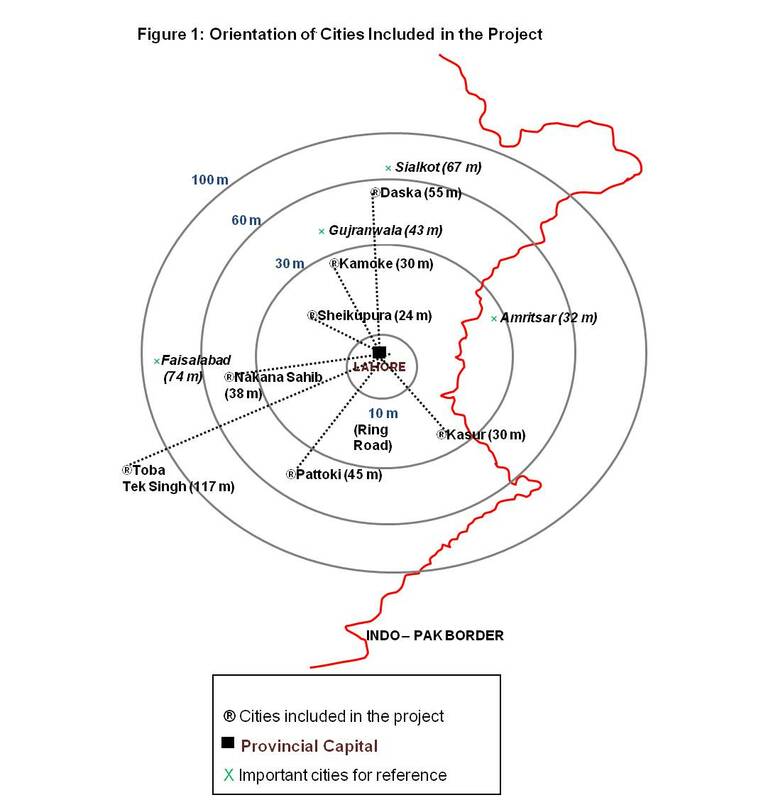 We have already carried out a pilot study of small towns in Pakistan centered round Lahore – see schematic below (click to enlarge). Some of the readers might be surprised to know that Amritsar is just 30 miles from Lahore, an easy drive for lunch! What’s happening in Karachi is obvious for all to see. Why it’s happening is less obvious and, for that reason, the cause of much speculation. City size is back in fashion as a variable of interest and this time bigness is being viewed as an advantage. This is quite a change from the perspective that prevailed for years when countries, specially developing ones, were decidedly anti-urban and wished to retard migration to prevent cities from increasing in size. Size was seen as a handicap and served as an excuse to explain away the problems of big cities. How should we see Karachi in this new perspective?